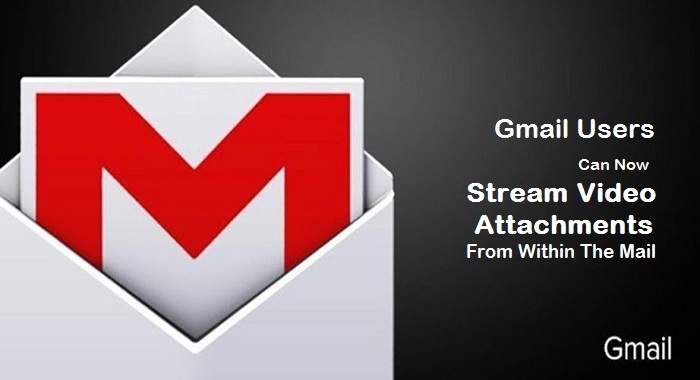 Google’s Gmail service has received a very useful update which will allow users to stream video attachments from within the mail. This means, you now have the option to preview a video attachment in Gmail before considering whether to download it or not. Before now, the only way you can access video attachments in Gmail (for computer users) is to first download it to your computer’s hard drive and open it in a YouTube-style media player. Interestingly, the video player lets you play the clip back, adjust quality and sound levels, and even stream it to a Chromecast device. Like most updates that come as beta testing, not all users can use the feature right away. Google says the feature is rolling out to everyone but may take up to 2 weeks before some users see it. It is not clear if the feature will be seen on the mobile Gmail app as well. According to the official press release, the new video streaming feature uses the same infrastructure as YouTube, Google Drive, and other video streaming applications. With that in mind, video attachments will be delivered “at optimal quality and availability”. Recently, Google increased the file size limit for Gmail. Users can now receive files of up to 50MB in size. However, you can only send up to 25MB in attachments. If your file is greater than 25MB, Gmail adds a Google Drive link in the email instead of including it as an attachment. Now, it’s interesting to note that this quality of life change might be more relevant for smaller video files rather than large ones. The 25 MB rule applies to all file types and it’s unclear whether or not this will continue to be the case for videos. Nevertheless, video file attachments smaller than 25 MB are sure to take advantage of the new feature, as they will now be easily accessed and viewed from within the body of the email without having to be downloaded on the local machine. Meanwhile, Google has added several productive features to the Gmail service. A few days ago, Google reportedly announced that the Android Gmail application was recently updated to join it’s desktop client to support monetary transactions and allow users to send and request money through Google Wallet. The Web giant also said it expects to start letting users browse and install Gmail add-ons from Intuit QuickBooks, PropserWorks, Salesforce, and others later this year. Earlier this month still, Gmail for Android was updated to support shortcuts, allowing users to pin shortcuts for different Gmail accounts on their home screens. If you have received this update and was able to stream a video attachment, why not share your experience with us using the comment box below?